The biggest and best mini golf course on the Gold Coast, the exciting 18 hole course weaves through a rocky terrain, streams, water traps and a swinging pole, testing the skills of even the most experienced golfer. Available for play from dawn to dusk, the fully licenced, The Club Mini Golf is the perfect family activity and a sure winner for your next get-together with friends and family. We don’t take bookings, simply pay to play on arrival at the Parkwood Village Golf Pro shop. Any group bookings larger than 12 should call ahead to ensure availability. Latest entry to the course is 1 hour prior to closing. When playing Mini Golf for 2 adults and 2 children, everyone gets in for $35. That’s a saving of $11. No bookings needed, just turn up! * Members price - $39 for Public. Looking for the ideal destination and activity for your next birthday? The Club offer a variety of party options, designed to satisfy all tastes, budgets and ages. The kids will have a ball playing Mini Golf or Trampolining at Jummps Indoor trampoline centre before enjoying a delicious party feast in the restaurant all while you put your feet up. Need a break from the office? Why not organise your next team building function at The Club Golf Course and tackle the The Club Mini Golf Course. Looking for unique Gold Coast school excursion ideas or activities? Then The Club Mini Golf Course is a great choice for teachers looking to engage their students in a healthy, safe and relaxed environment. As the largest mini golf course in Queensland, it will test even the best golfers in your class or year group. 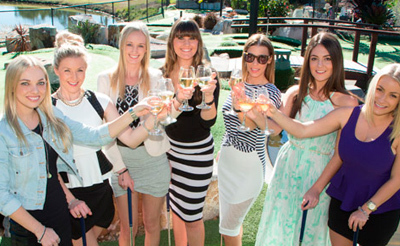 Are you the Gold Coast's BEST Mini Golf Team? Get your mates together for a midweek beer and pizza whilst playing Australia's largest mini golf course in a 2-person team match play format.